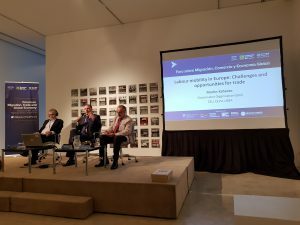 The Global Labor Organization (GLO) was represented at the Forum on Migration, Trade and the Global Economy on December 14, 2017, in Buenos Aires by Martin Kahanec, CEU professor and member of GLO’s Advisory Board and leader of its “EU Mobility” and “Hungary” thematic and geographic clusters, respectively. 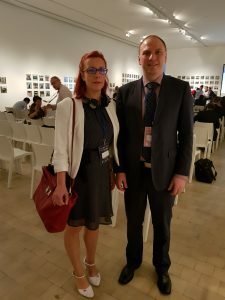 Also present was GLO’s Slovak cluster leader and Managing Director at the Bratislava-based Central European Labor Studies Institute (CELSI), Marta Kahancová. The Forum was organized by the International Organization for Migration (IOM), Fundación Foro del Sur (FFS), and the International Centre for Trade and Sustainable Development (ICTSD) as a side event of the 11th WTO Ministerial Conference taking place in Buenos Aires during the same week. See IOM reporting. The opening panel stressed the importance of the nexus between migration and trade, and highlighted the relevance of the event for this under-researched topic. “It is obvious that migrants contribute to trade and investment through their work, small businesses, knowledge and technology; however, we are aware that more research on the link between migration and trade is required,” underscored Diego Beltrand, IOM’s Regional Director for South America. In the ensuing panels leading experts, policymakers and researches explored key migration questions such as policies and frameworks governing international migrations; their relation to international flows of goods, services, investment and knowledge; and the impact of digital technologies, innovation networks, diaspora communities, as well as regional integration processes and bilateral and multi-lateral mobility agreements. In his contribution, Martin Kahanec advanced three arguments. First, demographic transitions in most advanced economies feature aging, lack of dynamic, entrepreneurial, and innovative labor, and risks for public budgets. Mobile workers may help to alleviate the economic vulnerabilities associated with these demographic trends by bringing in young and dynamic workers where they are needed. Second, Europe’s experience shows that labor mobility comes with a policy challenge: In spite of prevailing evidence of generally positive impacts of migration on host countries, natives tend to look upon immigration with aversion and fear. A negative policy spiral may start spinning: negative attitudes of voters result in ill-chosen policies, which in turn drive negative labor market and social outcomes and these, completing the circle, fuel further negative attitudes. Third, research conducted in cooperation within the GLO network shows that the notions that immigrants crowd natives out of their jobs, lower their wages, steal their welfare, or target countries with generous welfare provision are unfounded. To the contrary, this research shows that immigration fosters trade, creates jobs in the long run, and immigrants are more responsive to labor shortages than the natives. This last finding is important, as it implies that immigrants go precisely to those sectors, occupations and countries which need them most. 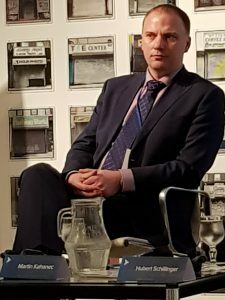 “The bottom line is that free mobility of labor has a definite potential to benefit the receiving countries, but to enable such benefits politicians must engage in a dialogue with their voters to explain the benefits and opportunities free mobility entails, as well as effective strategies of coping with any actual or perceived risks of immigration”, concluded Kahanec.